After years of being considered a second-level sport in America, volleyball became a favorite American pastime over the last three decades. In the 1980s and 1990s, American volleyball players began asserting themselves during international play in both indoor and beach volleyball events held around the world. In 1988, the USA Men’s Volleyball team took the gold medal at the Olympic Games, establishing such greats as Karch Kiraly, Steve Timmons and Eric Sato as household names. When many of the players from the “greatest team of all-time” took to the beach, beach volleyball and the AVP Tour had a resurgence. With women’s volleyball also showing improvement in the 1990s, the 21st century has given birth to some on the best players in the world. Thomas Hoff – Hailing from Chicago, Illinois, Hoff’s college career was split between Ohio State and Long Beach State. While at LBSU, The middle-blocker became a NCAA record holder for most games with 10 or more blocks at 9 and 20 or more kills at 25. 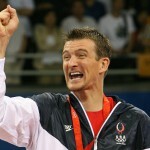 As a member of the USA National Team, he led the USA to Olympic Gold in 2008 and NORCECA Championship in 2005. Lloy Ball – Born in Fort Wayne, Indiana, Ball played collegiate volleyball at Indiana University-Purdue University Fort Wayne where he was named Volleyball Magazine National Freshman of the Year in his first year. After graduation, he became a regular fixture on the USA’s Men’s National Team where he anchored the 2008 Olympic gold team as setter. 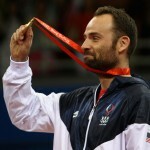 In 2007, he was named “Best Setter” and Most Valuable Player as the US captured it’s first World League title. 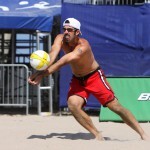 Phil Dalhausser – Born in Baden, Aargau, Switzerland, Dalhausser moved to Florida as a young boy. After a successful career at University of Central Florida, he took to the beach where he has become one of the most dominant players in the world. 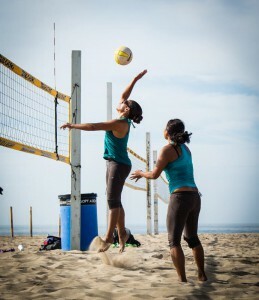 While teamed with Todd Rodgers, they dominated international and AVP Tour play during the late 2000s. They won Olympic Gold in 2008 and several World Tour and World Championship titles between 2006-2009. In 2012, he joined forces with Sean Rosenthal and has continued to be a top-ranked player. Todd Rodgers – The Santa Barbara native spent his college career at UC Santa Barbara where he was twice named Second Team All-American by the AVCA. During his early beach volleyball career, he enjoyed moderate success when teamed with Dax Holdren and Sean Scott. When he took a young Phil Dalhausser under his wings in 2006, the duo became the top-ranked team in the world from 2006-2012. Included in his long list of victories were Olympic Gold in 2008 and an endless list of World Tour and AVP titles. Danielle Scott Arruda – After earning NCAA Player of the Year honors in 1993 while playing with Long Beach State, Arruda became one of the most decorated USA Women’s Team players in history. She was a key component in helping the US team to back-to-back Olympic silver medals (2008 & 2012) and also helped the team claim four FIVB World Grand Prix gold medals (2001, 2010-2012). 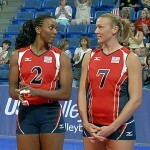 Nicole Davis – Born in Stockton, California, Davis has accumulated an impressive indoor volleyball resume. In 2002 & 2003, she led the USC Trojans to back-to-back NCAA Championships playing the libero position. As a member of USA Women’s National Team, she picked up silver medals in the 2008 & 2012 Olympic Games and a Gold Medal in the 2014 World Championships held in Italy. Misty May-Treanor – The Los Angeles, California native played her college volleyball at Long Beach State where she captained the first undefeated women’s team in NCAA history. Instead of playing on the US’ National Team, May-Treanor headed for the sunshine where she became the greatest women’s beach volleyball player in the world. Teaming with Kerri Walsh-Jennings, she won gold in three consecutive Olympics (2004, 2008, 2012) and became the leading money winner of all-time on the AVP Tour. Kerri Walsh-Jennings – Born on August 15, 1978, the Southern California native spent four years at Stanford University where she earned All-American honors 4-years in a row, including Co-Player of the Year (1999). After a Minor stint with the US Women’s Indoor Team, she took to the beach where she teamed up with Misty May-Treanor to win three Olympic gold medals (2004, 2008, 2012) and over 100 AVP pro-tour titles.